WWF’s Pavel Fomenko and Sergei Aramilev from the Amur Tiger Center in Vladivostok share their insights with RBTH on tiger preservation. A census held last winter in the Russian Far East's cedar and oak forests revealed that there are only 523 to 540 tigers left in the area. This is around the same number as ten years ago. The arrest of the decline in tiger numbers is largely due to the efforts of wildlife conservationists, who were able to lobby the government for necessary changes to legislation and introduce new approaches to conservation. The conservation efforts were also helped by the fact that in Vladimir Putin took a personal interest in protecting the tiger in 2008. Even though specialists criticize the president's program (link for our text), the number of people who want to personally challenge Putin has fallen. 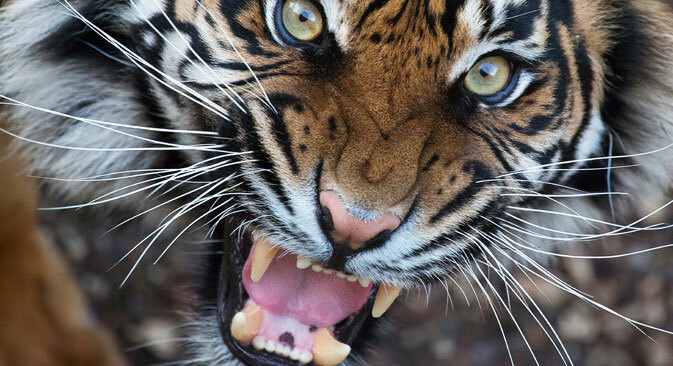 RBTH spoke with Pavel Fomenko, Species Program Coordinator of WWF Russia’s Amur branch and Sergei Aramilev, Director of the Amur Tiger Center in Vladivostok to find out what needs to be done to protect the large predator. The criminal code article introduced in Russia in December 2013 made keeping any body part of the tiger illegal. Violating this law is punishable with a large fine and imprisonment. Laws should not just protect the tiger but also the forests where it lives and its prey. The Amur tiger’s habitat is around 160,000 square kilometers. These forests are protected by the hunting and forest surveillance authorities. The police also look out for illegal felling of trees and poaching of the tiger and its food, while the Ministry of Emergency Situations helps put out fires. In the Primorye and Khabarovsk Territories, the hunting surveillance authorities have created special groups for resolving all types of conflicts between tigers and people. If the tiger is ill or wounded, he is placed in a rehabilitation center and after the treatment is returned to the wild, if possible. Statistics reveal that the tiger is not an animal that seeks to confront humans, and in an overwhelming number of cases, humans are responsible for conflicts. In order to make the image of the tiger less frightening, the city of Vladivostok started celebrating Tiger Day every year, while the popular children's program "Good night, little ones!" has created the Mur tiger cub character. Once every ten years, the Russian Far East carries out a large tiger census, which in its organization and dimension resembles a special military operation and takes up almost half a year. Only qualified specialists can participate in the census, such as professional hunters and scientists. The information gathered during the census is essential for protective measures not only for the tiger but also for other endangered animals, including the Amur leopard. An annual census is performed only on 25 percent of the tiger's overall habitat. The area is used as a sample. The objective of the tigress is not to teach her cub how to hunt but to raise him until the age when he can do it on his own. Russia does not follow the practice of raising tiger cubs in captivity and returning them to the wild. It is easier and more cost effective to focus on the preservation of the existing wild population. In Russia, there are more cases of saving orphan tiger cubs and returning them to the wild. The main aim of the rehabilitation is to make the tiger extremely afraid of human domestic activity and humans in general. Only then will the tiger be able to survive in the wild.